BOISE, IDAHO -- Federal authorities on Thursday rejected a request by an Idaho utility to negate an Oregon law requiring fish passage as part of relicensing for a hydroelectric project on the Snake River where it forms the border between Idaho and Oregon. 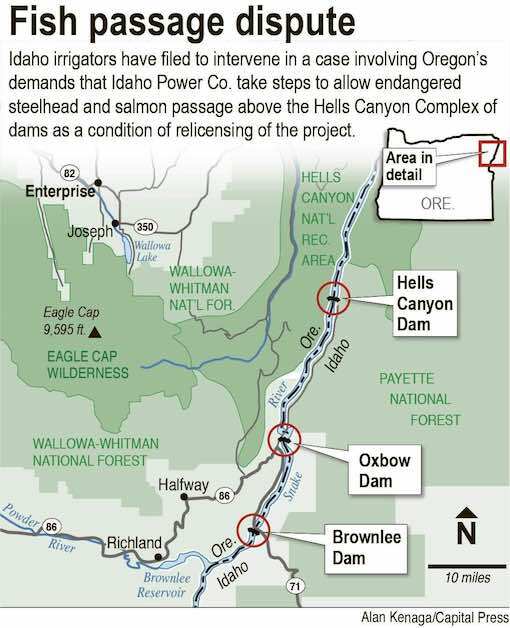 The Federal Energy Regulatory Commission dismissed the petition by Boise-based Idaho Power asking to exempt the three-dam Hells Canyon Complex from the Oregon statute. The filing in December said the Supremacy Clause of the U.S. Constitution that has to do with federal authority over states pre-empts the Oregon law. But the commission in the 14-page decision said it found no reason why Oregon couldn't require fish passage and reintroduction as part of relicensing. While Oregon requires fish passage, Idaho lawmakers have prohibited moving salmon and steelhead upstream of the three dams. That leaves the relicensing in limbo. "We're still stuck between the state of Oregon and Idaho with their conflicting positions," said Idaho Power spokesman Brad Bowlin. He said the company was still evaluating the commission's decision and had no comment on that. Idaho Power's 50-year license to operate the complex expired in 2005, and the company has since been operating on annually issued licenses. The main problem, the company said in the filing, has been obtaining Clean Water Act certifications from the two states. "If this had been granted it would have squashed Oregon's ability to regulate its own water quality-to Idaho Power's benefit," said Kevin Lewis of Idaho Rivers United, an environmental group that works to protect and restore rivers. In the utility company's filing, it notes that Oregon has said it wants salmon and steelhead to be able to access four Oregon tributaries that feed into the Hells Canyon Complex. To do this, the company would have to trap and transport the fish, which would require approval from Idaho. But Idaho is against reintroducing salmon and steelhead above the dams, and has passed a law opposing reintroduction of any species without the consent of the Legislature and governor. Biologists have said the Snake River above the dams is so degraded it couldn't support salmon and steelhead without significant rehabilitation work, which would require cooperation from landowners. Idaho Power supplies electricity to customers in southern Idaho and eastern Oregon. The Hells Canyon Complex produces about 40 percent of the company's total annual power generation, the company said in its filing.